The mother of NCL president Andy Stuart has waded into a international debate about whether Kay Longstaff could have accidentally fallen from the Norwegian Star amid claims that the 46-year-old air hostess deliberately jumped from the seventh deck. Ms Longstaff was rescued off the coast of Croatia after spending the night treading water in the Adriatic after she went overboard shortly before midnight on Saturday. She claimed she fell from the deck and managed to stay alive in the water, which was reportedly around 25C, until she was spotted by coastguards - at 9.40 am the following day - by singing to herself. However, the Daily Telegraph said it had been contacted by the 83-year-old mother of NCL president Andy Stuart, who disputed claims that she fell. She allegedly told the paper: "She didn't fall off. She jumped. This has cost Norwegian Cruise Line $600,000. This stupid woman." Stuart's mother, who lives in England, added: "I spoke to Andrew at lunchtime. He phones me almost every day. What he said was 'this is fake news'. He said that she couldn't have fallen. You would have to take steps to climb over the railings. He said she jumped in the water." She said Stuart was annoyed that it had been implied that NCL, which was forced to divert the Norwegian Star and call in the coastguards to rescue Ms Longstaff, was at fault. This morning, Andy Harmer, CLIA UK and Ireland director said the cruise line 'could not comment directly on what might or might not have happened' to Ms Longstaff, but he added: "There are no known cases of someone acting responsibly who has accidentally fallen over the railing of a cruise ship. "Safety regulations, including uniform minimum railing and balcony heights of one metre, plus other structural barriers in place to prevent passengers, who are acting responsibly, from simply falling off a cruise ship. "Cruise lines are highly regulated with robust enforcement. The average ship undergoes dozens of announced and unannounced safety inspections per year, involving hundreds of man hours and covering thousands of specific requirements set by the International Maritime Organization." 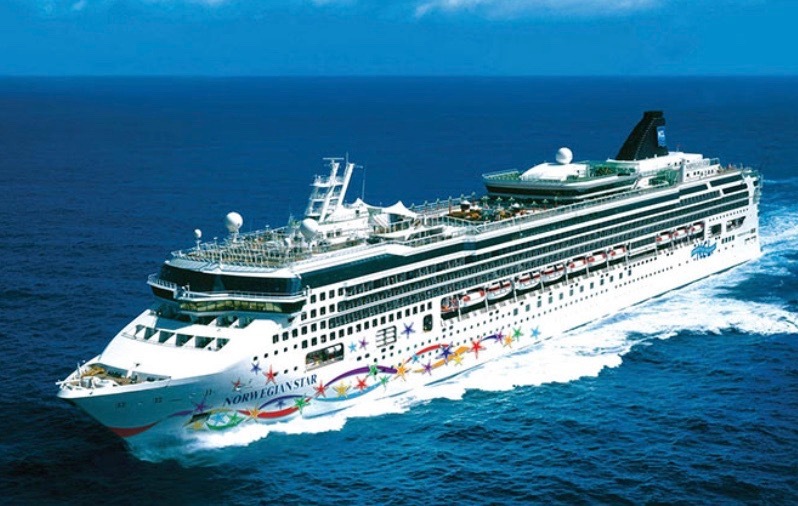 Other passengers on the cruise claimed that the captain of the Norwegian Star woke passengers with an announcement saying there was 'a jumper'. CCTV footage is also reported to show that Ms Longstaff jumped overboard. Some passenger said she had been rowing with her boyfriend Craig Rayment, who reported her missing several hours after she went overboard. Others have vented frustration at the disruption caused by the incident, with some claiming that they were poorly treated by the cruise line after they missed flight connections home from Venice, having been left to re-arrange their own travel. NCL issued a statement saying: "We are very happy that the individual, who is a UK resident, is now safe and will soon be reunited with friends and family. We remain in contact with the guest and her family. We continue to cooperate with authorities investigating this matter." Ms Longstaff is believed to have worked as an air hostess for British Airways before taking a job with a private jet company.